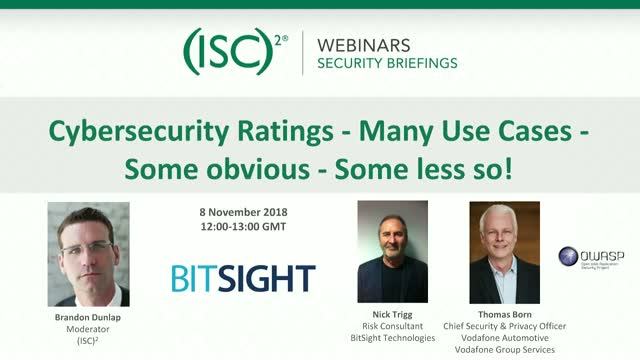 In the last (ISC)² and Bitsight webinar we covered good reasons for utilising security ratings, covering the big topics of visibility, collaboration and agility. Join us for this session where Nick Trigg, BitSight’s Risk Consultant, will share real life examples and use cases. Alongside Nick, we are pleased to welcome Thomas Born, Chief Security & Privacy Officer from Vodafone Automotive at Vodafone Group Services who will share his topical experiences.